A couple of weeks ago I made a post-rock playlist for MiaoMix and included “Quiet” by The Calm Blue Sea. That was a song that really blew me away the first time I listened to it. I recently got the chance to talk with Steve (drummer) and Kyle (bassist) from the band. We talked about working on new material, the music scene in Austin, comparisons to other post-rock bands, and more. They were really nice guys and it was a pleasure to get the chance to talk with them. Steve started out the interview and then Kyle came in about halfway into the interview. What are your names and specific roles in the band? Steve: I’m Steve and I play drums and we all write. So you and Kyle (bassist) were both there when the band started? Steve: I guess I’m an original member and Kyle is not. He’s our 2nd or 3rd bass player, but he’s been with us since 2009 so I don’t think he’s going anywhere. Why did you guys choose the name The Calm Blue Sea? Steve: Okay, I have no explanation for that. Maybe Chris does, but they had it when I got in already. Well I think it’s a common post-rock name and it fits your band pretty well. Steve: Okay, I can live with that. What does it feel like to have Paul Beck direct the video for “Literal”? Steve: It was really cool that he was so psyched to do it. That kind of caught me off guard. I mean his body of work is quite respectable as it is. So we were all pretty wowed by that process. Did you guys contact him or did he contact you guys? Steve: He was a friend of a friend and somebody gave him the record and he was into that song and had an idea so it kind of gelled from him I gather. The self-titled album is fantastic, but why did you guys choose to reissue it? Steve: For a handful of reason. Our friends Chip and Erin Adams were starting Modern Outsider and kind of approached us and were in the process of coming back together. For me, I wanted to see it on LP. So getting it on vinyl was a big part of that. Honestly, I think it sounds better on vinyl than any other format. What happened with the hiatus and how did you guys come back from that? Steve: We were putting together our last real tour in 2009 and it wasn’t anything huge it was just like two weeks up in toronto and in the east coast and back to the midwest. But we lost our keyboard player and our guitar player who were both original members and we picked up a sub who I’m in another band with and we just got back to that tour and all of a sudden it’s just three of us. Chris just got a job offer in New York and he never lived anywhere outside of Texas. We’ve really attacked it for two solid years. We made our full length and it’s not an official album, but we did a film soundtrack and that was a pretty exhausting process. We kind of killed ourselves for two straight years and decided it was time for a break. That ended up being like 18 months or something and then Chris had another job offer and things sort of lined up for him to get back together around here. So everything kind of just came together. There was a lot of luck involved, I’m not gonna lie. What did you guys do in between that time? Did you perform in any other bands? Steve: Yeah, I have an afrobeat group that I’m also a working musician and whatever else I get called for. 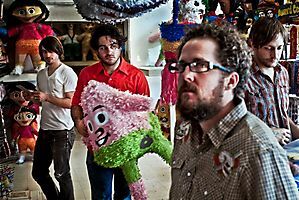 We all had day jobs and Kyle probably made two records with a band called Frank Smith and he also joined a band called The Couch. He’s a busy guy. Chris played in something in Brooklyn called The Pet Ghost Project. It sounds like you guys were pretty busy. Steve: We’re all still active, it’s just that we needed to do other things for a while. We’re huge music fans, all of us, and I think if we would have to be in one band all the time we’d probably go nuts. What was it like self-releasing the album and touring without any outside help compared to now, being signed to Modern Outsider Records? Steve: Well, I mean we’re still booking ourselves and that’s the hard part, but having other people help with your PR and sending out press and knowing a lot more people who can listen to your record. That helps immensely, I meant not having to cold call people for gigs and all this other stuff. I mean we’ve got a lot of attention from NPR and if you could point it to that, you can find it a lot easier to book yourself in the middle of Missouri. By the time we get another record out hopefully we’ll have a booking agency and most of that will be off our plate I hope. I heard you guys were working on new material for an album. Has there been any progress with this? Steve: Yeah, we’ve got like four new songs that we’re already playing live. We’re playing some new stuff and writing some new stuff. We booked some more studio time in January so the wheels are turning and things are happening. It’s always exciting to go back inside the studio and we’re all thinking about arrangements and such. What are crowds like during an average show and do they react well to your new songs? Steve: So far, yeah. The last one we played was a festival and everybody kind of rolled into the room and approving. They seemed to be really into it. I don’t know if we were all super happy with our performance that night, but that was the first time we played a handful of the new songs, but they went as well as they could. What’s it like performing out of your hometown? Steve: It depends where. We visited a handful of places where there were a ton of people. I can remember a night on the floor where two of them were half-dead sick on cold medicine and there were four people there and maybe it wasn’t so good, but you know we still gave it what we could. Were there any particular places that were more well-received than others? Steve: We always had a good time in Pittsburgh. We had a lot of people who seemed to dig us in Ohio around the Cincinnati area, but we haven’t even had a chance to go out to the west coast or anything. We still got a lot of places left to play. Whats your take on the huge music scene in Austin, Texas? Has that helped shape what you guys are now? Steve: I think with the sheer volume of acts in this town you really have to take the whole process seriously as far as a presentation standpoint. Like you can’t just write a couple of songs and show up and play them. When we first started we said we’re not taking this out of the practice room until it can be something we can absolutely stand behind and we’re gonna get out there and look like a band and not just a bunch of dudes doing this for fun. You gotta really look like you’re doing it for real around here. Yes, there’s thousands of bands playing a show in three weeks, but those could just be a bunch of dudes from an advertising agency showing up in shorts and flip flops and playing a Ramones cover. You got to set yourself apart from that. For me this is a band where I learn to do things like that the right way; not just taking it out of the practice room, but really getting all of the songs down and getting it right. I know that there’s been some popular post-rock bands that have come out of there. Would you say there is a post-rock scene in Austin? Steve: I don’t think they’re more in general into it than anywhere else. I mean given how many bands there are in the world and given how many bands there are in Austin I’d say like the averages just work out? You know what I’m trying to say? If post-rock means 3% of all bands worldwide, then it means 3% of bands in Austin and we have a fuckton of bands here so naturally there’s going to be a handful of post-rock bands. Somehow there’s a club of mostly instrumental bands. When did you decide you wanted to play post-rock music? Steve: I think Chris and Max and Jeff.. Max and Jeff are gone now, but they were in other rock bands at the time but decided they wanted to get together in Jeff’s old living room and mess around. Eventually they put a craigslist ad out for a drummer and I showed up. I don’t even remember what that Craigslist ad said… something about Mogwai and Mono. So I decided, yeah I can try that. It just all felt right and I don’t know if we’re making typical post-rock. We have a lot more vocals these days, not lyrics, but vocals where it’s like another instrument. Like anybody else who finds themselves in a “post-rock band”, I don’t know how to explain it, but it’s music like anything else. It’s not catchy three-minute rock songs. I’m curious as to what the songwriting process is like? Does everybody contribute to a song? Steve: In one way or another, yeah. Usually people bring in little ideas or larger ideas and then somebody else throws their opinion in or I put a beat into it. *beep* We’re doing a lot of improvisation now to kind of come up with ideas, so we record all of that and try to put the pieces we like. It’s a little bit of everything. I don’t know what that beep was, maybe somebody else just joined? Kyle: That was me. Sorry, I was stuck in a meeting I couldn’t get out of. So I just asked about the songwriting process. Do you guys think that you’ve evolved since the formation. Are you guys trying anything different for the new album? Kyle: I can definitely take that one for my point of view. I think one of the things that we are doing is that we’re collaborating a lot together and we’re definitely building off of ideas that come off from jamming or creating kind of in the moment. We kind of do it two ways: Chris likes to compose and put an idea together and build it into something and bring it in, but I’ve seen us evolve into starting to see more jamming and work off ideas from there. Steve: Yeah, it’s been more of a group process these days. Kyle: Yeah, that’s maybe the best way to put it. So do you guys get together and write a song in one session? Steve: That happened once, but no it’s just a process of several weeks. I mean, we’re still in a process of rearranging songs from the self-titled like tightening things up or stretching things out. So everything’s an evolution all the time. Kyle: Yeah, with our songs, too, sometimes it’ll be like we’ll play a certain part a certain number of times, but a lot of the time it’ll be more like, “Let’s play this until whoever feels like we need to change the queue” and then we change, you know. And even building part-to-part type things, it might take a matter of weeks. Like we might have an idea we really like and just kind of sit on it for a while or play it and develop it into our own thing until we figure out other parts that might go with it. It might come from rejected song ideas or just something new that came up in a rehearsal or something. It’s a pretty organic process these days. It does just sort of evolve. So I’m sure we’ll be refining the songs that are about to be recorded for the new record. Steve: And then we’ll be frustrated by them for years when we come up with better ideas for them. When you guys perform live is there any improvisation or is there always a certain arrangement for your songs? Steve: I think within ourselves, I mean I honestly never play drums the same way twice, but the more and more as we play these things the forms stay the same. There was a lot more of a elasticity when we first started out. Chris doesn’t like lengthy, lengthy songs. I maybe have a little more patience, but then I kind of agree with him that not everything needs to be 13 minutes. So we kind of arrange it in forms here and there. Kyle: I think within parts though, our arrangements seem to fairly set these days. Barring a few things, we’ll take something out if it feels like it needs to change, but within the forms we are definitely there is variation of how to play it from person to person. I know that Steve does things different, I do certain things different. There’s a little bit of that, a little bit of expressiveness, but we do try to keep it close to the spirit of what the song was when it was created. Especially for things like guitar melodies. So what kind of music are you guys listening to currently? Is there anything people wouldn’t expect you guys to listen to? Kyle: (laughs) The four of us each come from different places musically, so we all listen to different stuff. We all have a strong love for the instrumental music that has kind of shaped the general field that we play in, but I also feel like we come from some pretty divergent places. Right now, I have not been really digging into any new music. This is a good question for Chris, because he’s the guy that’s always on the front of whatever the coolest thing is happening in the world of music. I should just go through my music really quick and give you a better idea of that. Steve: I’m in a total grumpy old man phase and it’s frustrating me to no end. I’ve been revisiting some Zappaand I bought my wife this record of Thelonious Monk solo stuff and that was on in my house oner the weekend, but nothing new has been really blowing me away lately. Kyle: Yeah, my recent list of things I’ve listened to include Marvin Gaye. Steve: I’ve checked out the new Wilco record, that was pretty cool. Yeah, that was a great album. Kyle: Steve and I also play in a couple of other bands, too. So the other thing is that when I’m not playing music I’m usually not really that actively listening to it. I more often listen to stuff that I’m recording, so I’m not always listening to music like what other people are listening to. I like Fleet Foxes, The Flaming Lips. I’m a big Pixies fan, I always listen to Pixies a lot. Chris would give the obligatory The Twilight Sad answer for bands that he’s really into. Steve: What’s the band from Brooklyn that he really likes? Kyle: Oh, The Antlers? He loves The Antlers. Steve: He likes bands from Scotland a lot. I actually probably like We Were Promised Jetpacks more than him, but he’s really into The Twilight Sad and Frightened Rabbit and such. Kyle: I really like the new Ume record. I’m pretty happy with that. We’re on the label with them. They’re an awesome band. Steve: Yeah, they’re killing it. Kyle: I like The Sword. I like a lot of Austin bands. I tend to listen to a lot of local music too. Just friends or other bands from around here. Spoon, stuff like that. What’s it like being a part of SXSW in Austin? Kyle: (laughs) Most of us would really prefer to not live in Austin during that week. I mean it’s fun and it’s cool. Steve: Kyle’s lived here for 5 or so. And it seemed a little different when I moved here now. It’s more of a spring break destination than a music conference anymore. It’s all about these day parties and the music sometimes seems like an afterthought, but I mean I stick around for it because I have to. Kyle: Well because we’re usually playing in multiple bands in different shows. I think the point about it being the spring break destination, I’ve lived here for 5 years but played the last 6, and especially a lot of the non-SXSW affiliated things such as the ones that set up gigantic parties and have places for people to see music all day and drink a lot, they’re more focused about bringing really big name bands. So suddenly SXSW goes from this sort of vehicle for undiscovered music and it actually becomes a showcase for people like Kanye West, you know. Obviously, it’s not something that would help a music festival because people already know who he is. So there’s a lot of that stuff. A lot of big name bands come in and kind of overshadows the purpose of why everybody’s there, but at the same time, it’s a big celebration of music. There’s music in every possible crook and cranny of the city. So you do get exposed to a lot of cool new stuff. I do find music every year that I really appreciate. Steve: I mean it’s still possible to make some type of discovery. I mean I accidentally walked into Fleet Foxesfirst non-Washington state show a couple years ago and that was pretty amazing at the time. Unfortunately I don’t remember anything that mind-blowing since then. So you guys would prefer SXSW a few years ago compared to SXSW now? Steve: I don’t know. It was probably even better 15 years ago. Kyle: It’s definitely growing and there’s good things about it. It does a lot of good for Austin and I think from an experienced standpoint, it was a lot easier to navigate the world of SXSW earlier on before it starts to get really, really crowded, before it started to be everybody’s destination in March, but it is still cool to have it in our town. It’s good to know that everybody’s coming to Austin. Do you guys do anything differently to avoid sounding like any other post-rock band out there? Steve: I don’t know. Who do we sound like? I was going to ask you your thoughts on all the comparisons to Explosions in the Sky and Godspeed You! Black Emperor? Steve: I think given that they’re local we’re given that no matter what. As far as this music goes, I don’t listen to a lot of Explosions. I don’t really want to say who I do listen to, but it’s kind of unavoidable given that we’re in the same part of the country. I don’t think we sound anything like them. I hope we don’t. I think we want to sound like ourselves, no matter what that is. So would you take that comparison as offense? Steve: I’d say no. They’re still a great band. They do a great job. They do it very humbly and very wonderful wonderful people as far as I know. Kyle: I think any of that type of stuff is flattering. Obviously these people have accomplished a lot in what they do and I don’t think there’s any animosity anywhere about the comparisons or anything like that. For us, I think it’s really trying to be true to what it is we think we want to do. We don’t pull ideas from other sources as much as we’re saying “hey, does this sound too reminiscent of anything else?” We’ll try to steer away from doing things that maybe might be a bit formulaic. We’ve been adding more vocals, that’s something that’s changing for us. There’s a lot more prominent vocal parts. Not necessarily songwriter lyrics, but using voice as a texture. I know that’s not unique in the post-rock world, but for how we’re implementing it is a little bit different. Kyle: Yeah, we don’t have a proper keyboard player like we did in the original record. The keyboardist left a couple years ago, right? Steve: Yeah, he left in 2009 and Jeff, the other guitarist, left shortly after. So what other bands are you guys in and does that influence the music that you guys write in the band together? Steve: My other main, original project is afrobeat, which is kind of African funk music. I doubt there’s many similarities except that it’s mostly instrumental. I mean either way, no matter what I’m playing, I try to make it somehow hypnotic even if I’m backing up a singer or god help me playing a wedding or something. Kyle: Yeah, the stuff that I do is your typical rock band type situation. I play in a three piece rock band calledThe Couch with our bandmate Taylor. He came into The Calm Blue Sea shortly after we played together inThe Couch and that’s a kind of indie rock band. I also play in a band called Frank Smith which is sort of indie rock at it’s core, but it’s got bits and pieces of some Americana type roots and would sort of fall more in the line of Wilco or Bryan Adams, but it’s still got it’s own bit of aggressiveness. I don’t know if i bring any of those bands into The Calm Blue Sea, but I know I bring elements of The Calm Blue Sea into these bands in terms of songwriting, dynamics and use of space. Steve: I mean both me and Kyle went to music school, so we bring some amount of classical training to the whole thing. Although I’ve spent a solid decade trying to forget everything I’ve learned in music school. Where do you see yourselves in 5 years? Any specific goals? Kyle: We have goals for next year, we haven’t necessarily stretched it out to a five year plan, but I think it can be extrapolated. For us it’s focusing on getting this record written, recorded, and released and then getting out and touring. Those are the goals that we’ve established and we are all very much on board with them and very clear with what those goals are. Touring Europe is part of that tour plan next year. We all want to do that and we have a lot of people in Europe that know who we are and even as much or more so than here in the US. So I think it would be good to get over there and play for people, too. Kyle: Beyond next year, for us it’s just to continue doing this and hopefully getting better at it and getting more support from people out there who like what we do so we keep doing it. We’re going to play music because we do not know what else to do with our time. We love playing music and we like playing this music with each other. Being able to do it more sustainably would be fantastic. When do you think the album will be released? Steve: Hopefully by mid to late summer next year. Kyle: We’ll have everything recorded early in the year, but there’s always those production timeframe, wrapping up all the press and stuff like that. We’ll probably have music for people to check out. Are you guys planning to ever do another film score? Steve: I personally love to work in film. That was a pretty exhausting process the first time around, but it was still one of the more rewarding musical experiences as far as I can remember. I mean I’d love to score an actual film that wasn’t already made. I’d love to be a part of the process from the beginning. Just as long as it’s not about high school football. Thank you so much for your time for doing this interview. Kyle: Thank you for this interview. Steve: Thanks for talking to us.